(17/9) TRENTON – The New Jersey State Forest Fire Service advises residents that its seasonal prescribed burning program – which reduces wildfire risks by burning away the buildup of undergrowth, fallen trees and branches, leaves, pine needles and other debris on forest floors – is under way. Residents are advised that they may see large plumes of smoke in areas where these controlled burns are being conducted. Prescribed burns will take place through the end of March, conditions permitting. These burns are generally conducted during the winter – especially toward the late-winter months – to minimize the amount of smoke produced, and when weather conditions tend to be safer for controlled fires. The New Jersey Division of Parks and Forestry will provide as much notice as possible of prescribed burns through its Facebook page at: www.facebook.com/newjerseyforests. The public may also contact the State Forest Fire Service at (609) 292-2977 about the prescribed burning program and where burns are expected to be conducted. When in doubt about the source of smoke or fire, call 9-1-1 or 877-WARN-DEP (877-927-6337). The peak wildfire season in New Jersey typically begins in middle to late March and runs through late spring, when the weather tends to be dry, windy and warmer. This also is the time of year when forest canopies and undergrowth have yet to leaf out, making forest debris more susceptible to the drying effects of wind and sunshine. 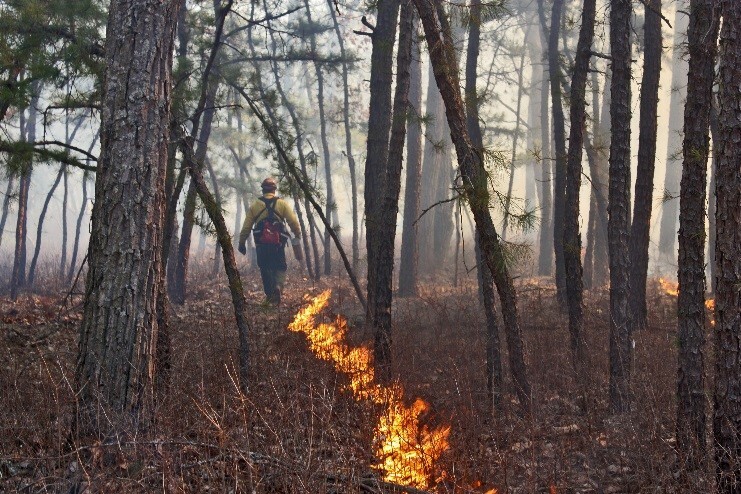 Because of the types of trees and shrubs it supports, the sprawling Pinelands region of southern New Jersey is particularly susceptible to wildfires and is typically the focus of much of the prescribed burning activity conducted by the Forest Fire Service. During prescribed burns, Forest Fire Service personnel use hand-held torches to set smaller fires to burn away fallen leaves, pine needles, fallen branches and other debris on the forest floor. The personnel take into account wind, moisture and other conditions. These prescribed fires do not reach the forest canopy or cause significant loss of mature trees as wildfires do. While the annual burning program began late last year, the Forest Fire Service is entering peak season for controlled burns. The Forest Fire Service expects to burn between 10,000 and 20,000 acres of forests and grasslands this season, depending on weather conditions. Most burns take place on state-owned property, such as state forests, parks and wildlife management areas. “Prescribed burning has been a successful wildland fire mitigation tool used by the Forest Fire Service since the 1920s, protecting property, lives and infrastructure by creating defensible space around developed areas and strategic fire breaks that help the Forest Fire Service quickly contain wildfires,” said Richard Boornazian, DEP’s Assistant Commissioner for Natural and Historic Resources. Roads in areas where burns are taking place are clearly marked. Motorists traveling through these areas are advised to observe posted reduced speed limits and to be alert to the presence of trucks and Forest Fire Service personnel. During the burns, firefighters employ best management practices to control smoke impacts, but nearby residents and forest visitors should expect temporary smoke. For more information on wildfires in New Jersey, steps you can take to protect your property and other resources, visit: www.njwildfire.org. For more information on New Jersey’s Statewide Forest Resource Assessment and Strategies, visit: www.nj.gov/dep/parksandforests/forest/docs/NJFSassessment.pdf. MEDIA NOTE: Media interested in seeing the program in action can make arrangements through the DEP’s Press Office at the numbers above.